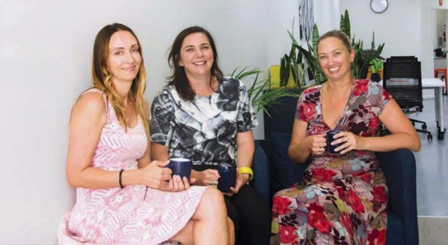 As shared work spaces continue to spring up all around the country, What’s On In Our Backyard are excited to introduce Spark CoWork, an entrepreneurial hub offering the perfect space for work-at-home business people. We recently sat down for a coffee and a chat with Naomi Farrelly and Beck Morley, who explained the idea behind the business and how it can foster creativity and boost productivity for small business. How did your idea for Spark come about? Like all great ideas, Spark CoWork was born over a coffee! A meeting to discuss work projects quickly turned into a conversation about the challenges we were facing with working from home. Whilst we both loved the flexibility it offered, we craved the personal connections and collaboration that comes from working in a shared space. The library was too quiet, the coffee shop was just too noisy and we couldn’t afford the rental of a serviced office. We knew we weren’t the only ones! Coworking is a relatively new term, especially in our area. What is it exactly? Coworking spaces are popping up all over the world and yes, this is a first for Port Stephens. They are spaces that are utilised by savvy business owners operating a range of businesses including sole traders, start ups, small business and many more. You can hire a comfortable, air conditioned workspace with access to all the tools needed to run your business efficiently and effectively. Anyone! Within days of opening, we had a lot of interest particularly from mums like ourselves who work from home. Mums who are trying to manage the work, life, family balance are finding that spending a few hours at Spark gives them the head space to knock over their work demands so they are free to focus completely on family time when they get home. We also see a lot of start-ups who can’t afford large overheads and tradies and their wives who pop in between jobs to work on admin; a welcome relief from working in the car! We have also welcomed a number of tourists staying in Port Stephens who have found internet speeds particularly slow at their hotels. It means they can come in for a few productive work hours and then get on with enjoying the rest of their holiday! What other advantages are there of using a coworking space? One of the biggest advantages is preventing isolation. We are social creatures by habit and even though people work on their own within the space, they are regularly engaging with others. Spark is an affordable workspace and offers great facilities and services to help grow your business. These include free car parking, option of sit or stand desks, ergonomic seating, fast and reliable internet, printing, photocopying and use of meeting rooms, as well as unlimited supply of tea and coffee because that is important! What is your vision for Spark? Our vision is to build a community of local business owners who support and encourage each other. We live by our values; Connect, Create, Collaborate, Community and are here to see people succeed! Our hope is that we can provide an amazing workspace, with wonderful training opportunities to upskill and programs that offer assistance (financial or otherwise) with the support needed to thrive not just to survive. Readers of What’s on in Our Backyard can access up to 4 hours of free coworking time to see whether it might work for you and your business. Valid every Thursday, readers can call 4058 1988, email hello@sparkcowork.com.au or wander in to redeem the voucher below.